Urban renewal is a hot topic and the Awesome Foundation is big into supporting into creative minded people who focus on harnessing a community’s energy to complement larger scale bricks and mortar development. The Boston Chapter awarded it’s February grant to artist and basketball enthusiast Maria Molteni in support of her mission to restore use of local abandoned b-ball courts by crafting DIY nets. This project harnesses the power of shared activity and public space in fostering a bond of trust between artists, athletes, and neighbors. The nets are designed to be colorful, vibrant additions to public spaces that go beyond being strictly functional. Installing unique hand-crafted products sets the stage for individual expression. 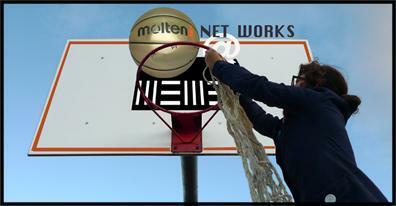 The MOLTENi NET WORKS project is well underway with a recent exhibit at Cambridge’s MEME Gallery in Central Square that also included workshops where participants were able to hand-crochet basketball nets to be installed on bare hoops. Efforts have begun locally in Allston, MA and there are several local organizations (Boston include Artists for Humanity, Villa Victoria Center for the Arts, Design Studio for Social Intervention, and Massart’s Fibers Department) interested in putting on more workshops. If you’d like to get pitch in, there are a few ways you can get involved. >> Join us for a drink! Come meet Maria at the Awesome Foundation Fellowship party on Thursday, April 28th @ Middlesex Lounge – 6PM. >> Give your time atnd skills by attending a workshop and putting in some elbow grease making nets. >> Have extra yarn or croquet tools that can help the cause? Email molteninetworks@gmail.com about what is needed. >> Kick in on the Kickstarter campaign so that the MOLTENi NET WORKS project can extend its reach across the globe to contribute to additional projects such as artist Kevin Clancy’s “Portable Utopia” in Johannesburg, South Africa.